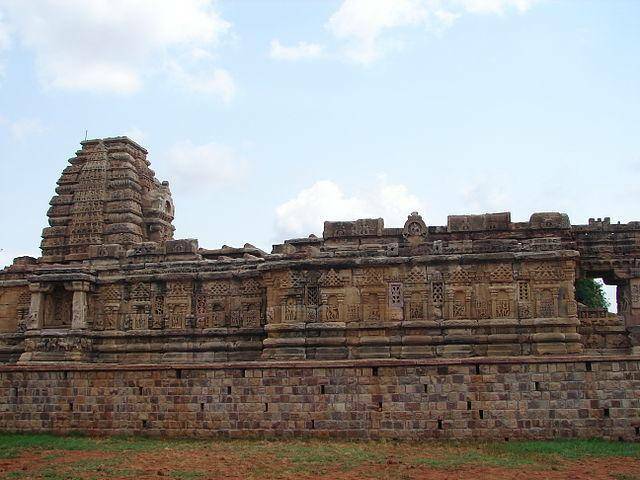 Papanatha Temple is dedicated to Lord Shiva and is situated to the south of Virupaksha temple in Pattadakal. Papanatha temple is believed to be dated back to 6th century. Papanatha temple is of mixed style architecture. The temple has a wide porch which welcomes you. Then follows the main hall where you can relax for a while. This main hall consists of 16 pillars on which you could find the carvings of couples and female figures which are astonishing piece of work. Before entering the sanctum sanctorum, you have to cross the huge antechamber. Also the sanctum sanctorum has a tower which was built of Rekhanagara Style of architecture. The main sanctum sanctorum was wrapped by passage called Paraghara. On the outer walls, Sculptures depicting scenes from Ramayana and lions, elephants, etc. are carved out finely.